Next week, I’ll join over 10,000 other water professionals at the annual American Water Works Association (AWWA) conference in Denver. Over 900 experts in the field will be presenting information on water resources, technology, education, research, utility management, and more. The field of water technology and management is constantly changing – and the challenges to water quality and water supply are mounting – so it’s important to be constantly learning. Anyone that knows me, knows I think it’s important that you learn something new every day. I would tell my kids if you don’t learn something new, you don’t qualify for dessert! It’s important to develop a constant thirst for knowledge. The AWWA annual conference is one way to quench this thirst – and there are great dessert tables at the vendor receptions! The Partnership for Safe Water is a voluntary effort between the US EPA, drinking water organizations, and more than 200 water utilities throughout the United States to go beyond current regulations to provide a superior level of water quality. The program was instituted in 1997 (following the 1993 outbreak of cryptosporidiosis in Milwaukee) to provide enhanced treatment barriers. In recent years the program has expanded to also include voluntary programs to optimize the operation of distribution systems. I’m proud that 200 utilities – serving about 85 million people, have stepped up joined the voluntary program. I’m also proud that about 70 American Water systems have achieved the Phase III Director’s Award. This year a number of them will receive recognition for maintaining this high level of treatment, consistently for 10 and even 15 years! It’s a well deserved salute to the men and women who consistently ensure safe, superior quality drinking water at about a penny a gallon; 24 hours a day, 7 days a week, 365 days a year. For that, we should all celebrate with dessert tonight! Dr. Water is thinking about hosting a live Twitter Chat. Would this be something you’d like to attend? What are some of the topic ideas you would be interested in seeing? Please give us your comments! Thanks for your informative blog! 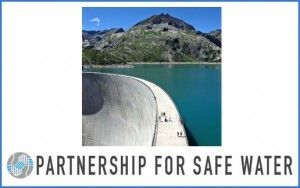 The Partnership for Safe Water sounds like a great program and I’m proud that American Water participates. The fact that about 70 American Water systems will be receiving awards for their high-level of superior service for 10 to 15 years speaks volumes about the dedication of our employees and the reliability of our systems. Congratulations to all – job well done!